The Byzantine Empire was heir to the Eastern Roman Empire. Its capital was set in an ancient Greek colony: Byzantine, renamed by Rome Constantinople, now Istanbul. The Roman Empire had great differences between East and West. West was basically rural, while the East was urban and industrialized. This gave East a strategic advantage in order to survive over the centuries.
. Centuries IX, X and XI were years of prosperity, but appeared a great new and powerful threat, the Turks. Crusades of the eleventh to thirteenth centuries got some air exhausted empire finally succumbed in 1453 when Mohamed II conquered Constantinople. The Byzantine Empire lasted from 395 to 1453 so it can boast of being the only state that survived throughout the Middle Ages and has been one of the big states that have influenced both Western European culture, as in Russia and the Islam. At first the Byzantine Empire held the Roman custom of basing its economy on the labor of slaves, with Egypt as a granary of the empire and burgeoning industrial and commercial cities, Alenjandría. Antioch and own Byzantine. In the eighth century, and after the loss of Egypt and Syria, the Byzantine Empire retained only not particularly fertile territories that were organized by a feudal system. The use of Latin was also abandoned in favor of the Greek and Roman name he was also abandoned by Byzantine, which is the Greek name for Constantinople. The Byzantine Empire was deeply Christian. The Church crowned Emperors and maintained tense relations of power with them. The patriarch of Byzantine remained tense relations with the Roman Church. In 1054 came the Schism that has survived to this day, when the patriarch Michael Cerularius broke with Rome. Byzantium was fortunate to retain art and Greek and Roman culture. The masterpiece is the Hagia Sophia, built under the reign of Justinian and today has been transformed into a museum. 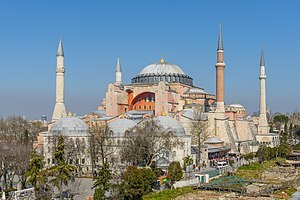 It is a spectacular piece of Byzantine architecture with Greek cross, a huge dome covering the central area and covered with impressive mosaics. After the fall of Constantinople was transformed into a mosque and served as a model for other mosques in Istanbul. Byzantium did not leave indifferent to other civilizations around her. Both European Christians, and Muslims, as the Slavic world was evangelized by Byzantium had the art, culture and science of Byzantium as a model to study and often imitated, such as the Basilica of San Marco in Venice with clear Byzantine influence. This page was last modified on 19 November 2015, at 01:00.